People may just think booking a piper is just booking a piper, however there are more options than you might realise. If you are in the market for something a little different to a classic piper here are a few options you could take into consideration. If you are looking for a little showmanship how about the self proclaimed “Badpiper?” This flame throwing, tattooed punk looks like he wandered off the set of Mad Max and has been delighting crowds around the world for over 15 years. He’s just maybe not one for your granny. Search YouTube and you’ll find The Badpiper performing his take on rock standards by AC/DC and Queen as well as his own signature tunes. His bagpipes spit fire in the process, resulting in some awesome visuals that your guests wouldn’t be forgetting anytime soon. Looking for something a little more surreal? Portland’s Unipiper is the guy that looked at The Badpipers flaming bagpipes and said “I can do more with this.” This video of a man, dressed in Darth Vader cosplay, a kilt, on a unicycle playing the Star Wars theme on his set of fire spitting bagpipes is probably the best thing you’ll see on the internet today…. ….unless that is, you’re more of a Game of Thrones fan. Not sure if he’s available for bookings but he’d certainly bring a memorable amount of of weirdness to the day. Altthough, again, maybe not one for your gran. Would they play at your wedding? You never know, but you’d have to book early. These guys are in high demand having played around the world not to mention a few times at T in the Park too. Of course if these ideas aren’t for you theres always Elite Bands’ handpicked piper, Stuart looks the part and is one of the best Scottish wedding pipers out there. 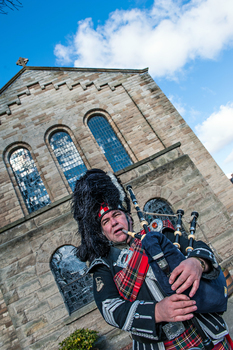 ← The Best Piper In Scotland!